35133 8 pc. 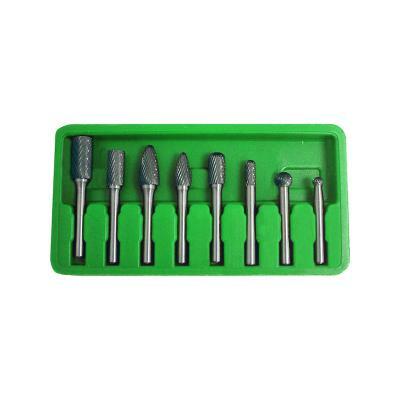 1/4" Shank Carbide Double Cut Rotary Burr Set 1 pc 1/2" x 1" cylindrical shape 1 pc 3/8” x 3/4” cylindrical shape 1 pc 3/8” x 3/4” cylindrical radius end 1 pc 1/4” x 5/8” cylindrical radius end 1 pc 1/4” ball shape 1 pc 3/8” ball shape 1 pc 3/8” x 3/4” tree shaped radius end 1/2” x 1” tree shaped radius end. blow mold storage tray.